Have you ever found yourself in the midst of a personal struggle, season of trial or time where you're really going through something and could really use some help? There may be that hesitation to share it...especially with certain people because by all means you "have be careful" with whom you share with. You have to have the trust factor with them. It's sad because so many suffer through things without telling anyone for fear of being judged because it seems some just don't care or are simply rude! Ever shared with obviously the wrong person (as you find out later)? Then you know what I mean! No one should have to go through these seasons alone and you and I should be able to find support, encouragement and comfort by being surrounded by those who care and will walk through those seasons with us...because they actually care! Then there are those who don't share because they've bought into the lie that they don't need anyone!? Or, those who don't ever want to give the perception that "they've got it all together!" There are also people who just don't care about anyone else in general that's a bleak existence to say the least but on the flip side...there are those who do genuinely care. Living in the US I find this ironic because in today's culture people want transparency from their leaders, government agencies and to some extent other people within our work, houses of worship and with our family and friends. However, when it comes to us as individuals we need to be honest and state that transparency is sometimes seen as largely only good if it "applies to other people" which is a mindset that has sadly crept into the church culture especially in the USA and elsewhere as well!? We're to share with one another and actually care about one another because we are truly connected and should be committed to one another! We're all in this together! 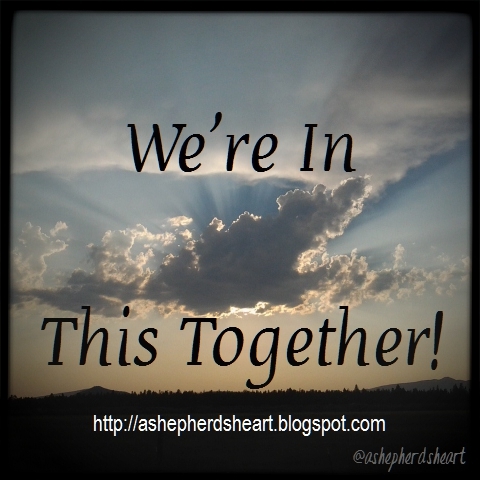 We should be committed to one another PERIOD! There is no excuse not to be! Our lives never have and never will be perfectly manicured as we try to pretend. Our relationships won't be perfect. Our health and finances wont be perfect. Our kids won't be perfect. The way we do or don't do schooling won't be perfect. Our cars won't be perfect and so on and so forth. Let's stop being fakers and let's get to doing life...real life...together! Let's stop trying to act like other people don't matter! Let's stop acting like our lives are perfect and other's lives are not! Let's flat out start doing things the way God has called us to do things! Let's stop hiding what we're going through and let us bring the truth of our struggles to light! No...more..fear! We're all supposed to be reliant on God and growing in grace...a work in progress...then why don't we start trying to let others in?! Maybe and shockingly...we can pull back the proverbial armor or walls, (the armor or walls we've fashioned to keep people out) we've encased ourselves in and take a step of faith to share our lives with others? Granted some still won't care and that's quite frankly on them and a huge miss on their part! However, on the other side...it's a risk worth taking as you just might find those who do care! You might also in the process of sharing what you've been through or are going through, you just might also bless someone else in hearing what you're going through as they just might think they're the only one who is struggling through that specific thing! Either way you can and will be used to encourage others! We're in this life TOGETHER so why don't we to start acting like it?! Let's roll up our sleeves and open our hearts to others and do this thing!